You are visitor since January 10, 1999. 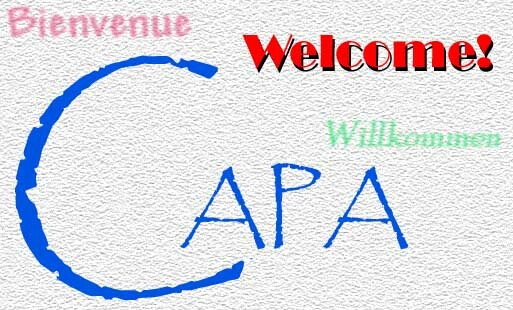 Welcome to the new CAPA help website. This website has been recently redesigned to improve readability of both the website and the solutions. Most of the original website text has been included again, with only minor updates for changing times. A few problems were discovered with the old solutions. On some computers, the solution file would not display properly. While not entirely reproducable, the problem was invariably caused by the proprietary fonts used in my typesetting program. The early versions of Adobe Acrobat (3.0 and 4.0) did not look at the font's copyright field. As a result, they were able to embed the font in the PDF file. The newer version of Acrobat (5.0) does look at this copyright field and went so far as to not load the embedded fonts that shouldn't have been included in the first place. Since the solutions were initially TEX files, it was fairly simple to regenerate them directly to PDF files. As a result, the solutions now appear clearer and don't suffer from the font problems. In addition, the questions to the problems have been included for reference to determine the exact problem being solved. Nearly all the grammatical inaccuracies were left in the questions. This was done to preserve the original question. Sometimes the error was ambiguous and changing it would force one particular interpretation. Note that even though the questions provide specific numbers for the problems, these CAPA solutions are guaranteed to work for everyone. This is due to the fact that the problems are solved symbolically, leaving only the substitution of the variables up to you. Each step is provided in great detail to aid understanding and additional explanation of concepts is sometimes provided, depending on the problem and nature of the solution. Disclaimer: This site is provided as a resource. Its intentions are to help with deriving solution formulas to CAPA problems. It is not intended to be used to quickly answer all the questions late Friday night. By not throughly understanding the derivation and application of physics, you are cheating yourself of the ver reason you partook of the challenge of earning a higher education. The user is responsible for all actions while using this site. The CAPA solutions are posted as Adobe PDF files. This was done to improve readability, increase ease of use, save time in preparing the solutions, and in the process allow greater portability. If you do not have the capability to read PDF files, follow the link below. Since the solutions are initially written in Latex, the TEX files are also available for regeneration. The graphics are not available. If you come across a solution that isn't working for you, double check your numbers. If it is still wrong, there is a possibility that the formula may have been typed wrong. If you have found an error and a way to fix it, please let me know so others may also have that benefit. If you wish to have your name credited with your finding, please let me know in your message. Otherwise, comments will remain anonymous by default. I try to double check the formulae after they are entered, but sometimes a typo will slip through. If you don't want or don't know how to find the error, periodically check this site. If errors are encoutered, they are fixed an a new version of the solution file is posted shortly after along with a message indicating the update. Download Adobe Acrobat 6.0 (8.7 MB (base) - 15.9 MB (full)) here.